Orange is such a fun, happy color. 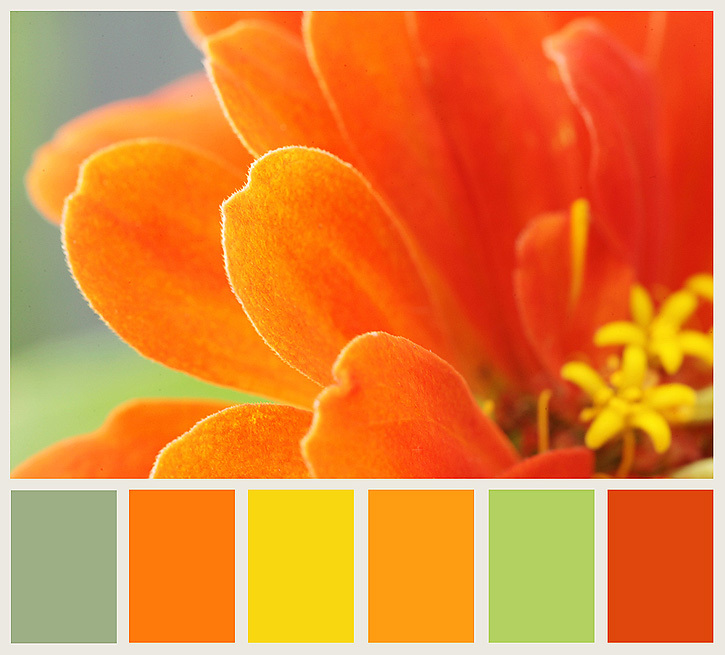 I definitely wanted to use one of my orange zinnia pics to see what colors I would find. I love the resulting palette. Beautiful! I feels so bright and sunny. The Color Orange. They should make a movie with that title... It's such a happy color. Oh Deb, I love, love, love this!! Oh Deb- it's gorgeous!!! These colors just scream summer! I love these colors! SO pretty and bright. I'll have to figure out how to do these color palettes sometime. It's very easy! You can download the template I use at the coffeeshop blog and she has directions there on how to use them too. What a gorgeous photo - a beautiful flower beautifully captured. The colour palette is so lovely and the grey/green colours make is so harmonious - I would never have thought those colours would work so well together. I love the greens that you chose to in it. Lovely picture. So zingy and just bursting with 'colour juice'! Love the vibrancy you've extracted from a very pretty macro. Deb, the orange is so bright and cheery! Love the crisp detail on that flower, too! Hope you're week is great so far. So pretty and fresh. I'm pleased you're enjoying your zinnias. Yes, I love orange! This pic is a beauty and I love the frame you used. This is gorgeous! Love the colors in the palette!